Whether you live in them or are apprehensive to wear something that could get so easily stained, one thing’s for certain: white denim is a huge spring trend. If you haven’t tried this look yet, now’s your chance! Grab a Tide to Go pen and rush out to find a pair – they are surprisingly flattering and versatile. 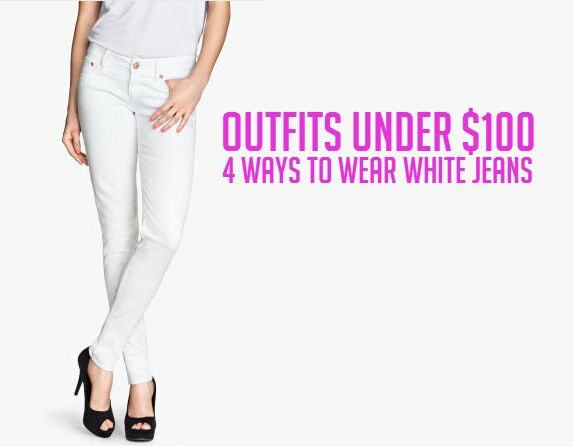 For this week’s installment of Outfits Under $100, we are spotlighting the many ways to wear white jeans. Whether you want to wear them dressed up or down, this post will give you oodles of inspiration on how to wear your bright whites. The best part? Each outfit rings in an under $100 total! 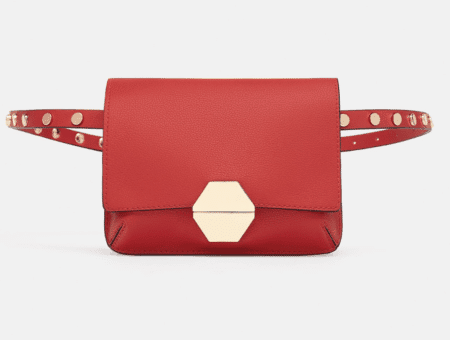 That way, you’ll keep your pocketbook and wardrobe happy. This season, the only thing trendier than white jeans is rocking a monochromatic ensemble. So for this look, we combined the two trends to create this chic, all-white getup. The key here is to wear the same color top-to-bottom, but to glam it up with bold gold accessories. 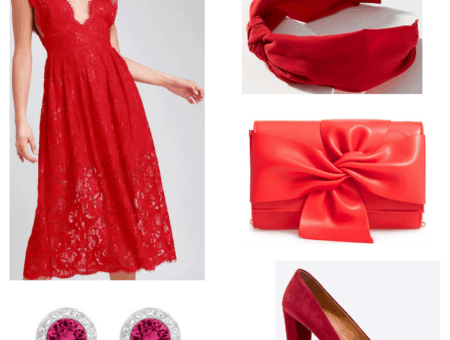 Don’t forget to add a pair of strappy hot pink sandals for an extra pop of color. 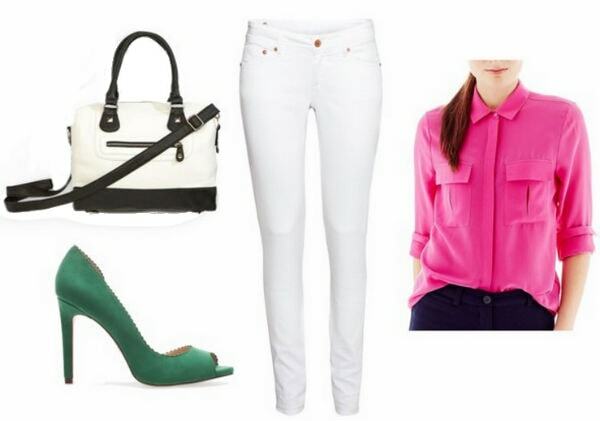 Sometimes bright whites need to be broken up, so try pairing white denim with a colorful button-up. This floral print blouse pairs perfectly with the jeans, and is on sale for just $20. Trendy mint-hued flats are ideal for spring, while a cool fringe bag helps to keep this look grounded. White jeans look so fun and fresh on the weekend, and unless you’re at Home Depot buying gigantic bags of soil, you don’t have that much to fear. A breezy, brightly-colored tank is ideal for running errands, and we paired it with these darling glittery sandals from Target. Keep the accessories minimal, but don’t forget some pastel nail polish. If you have a casual dress code at work or a relaxed Friday policy at your internship, try wearing white jeans at the office. The stark white hue makes this bold magenta button-up pop even more. Pair them with jade green pumps, then grab a black-and-white satchel for your necessities. 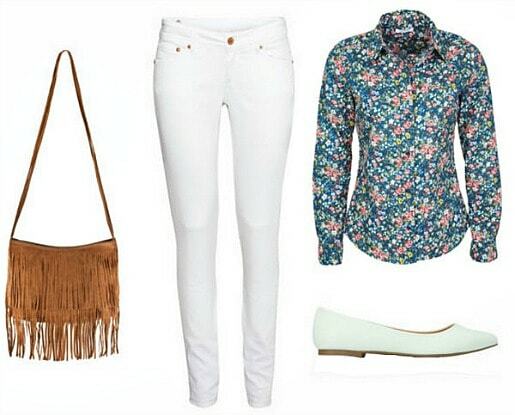 Do you love white jeans? Or have you yet to jump on the bandwagon? Which look above is your favorite? Do you wear them casually, dress them up, or both? Whatever your thoughts are, we want to know! So drop us a line in the comment section below.